The Virginia Tech team displays its house in Times Square in New York, New York, on January 28, 2010. Public tours: Learn where Lumenhaus might travel next by following updates on Facebook or Twitter. If a house could be a hitchhiker, Virginia Tech’s Lumenhaus would surely be among the most fascinating. The project—originally designed for the U.S. Department of Energy Solar Decathlon 2009—has gone far beyond the competition on the National Mall in its quest to enlighten the world. Lumenhaus began its itinerant ways even before the Solar Decathlon started. In August 2009, the house left the university’s Research + Demonstration Facility to go to the Blacksburg Shopping Center for a public demonstration day. The following month, it traveled to Washington, D.C. Lumenhaus was then set up on the National Building Museum’s 5th Street lawn as part of the exhibition Sustainable Communities: Greenovation. For three weeks, the public got a sneak peak at the house inspired by German-born architect Mies Van Der Rohe. Lumenhaus then moved across town to compete in Solar Decathlon 2009, where it left a distinct impression on visitors and took third place in the Architecture Contest. Lumenhaus’ next destination was the Big Apple. 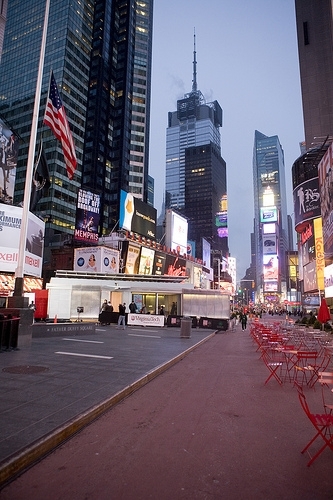 The Virginia Tech team reconstructed the house in New York City’s Times Square for a two-day exhibit, and the project was featured in a "Good Morning America" segment that aired on January 28, 2010. Lumenhaus then returned to the Blacksburg campus for about four months before beginning another journey. This time, the house was prepared to travel abroad. It left from the port of Baltimore, crossed the Atlantic Ocean, and passed through Hamburg, Germany, before arriving in Madrid, Spain. Lumenhaus was reconstructed again to participate in the first Solar Decathlon Europe competition in June 2010. It won first place. In May of 2011, Lumenhaus was exhibited next to its inspiration, the Farnsworth House in Plano, Illinois. Lumenhaus continues to receive attention and awards for its innovative design, receiving the AIA Institute Honor Award for Architecture in 2012.